Mercedes Benz seems adamant at filling up every niche possible with their recent slew of alphabetical soup attacks on the car industry â€“ the new A, B, R, as well as models with multi-alphabet designations like the new CLS, one of the very few coupes around that come with four doors. Here well be having a look at the recently launched B-class, a Mercedes Benz B170 with high spec trim to be exact. Read my report after the jump. Mercedes Benz calls the B170 a Sports Tourer, a 5-seater that gives you the versatility of a 5-door hatch small MPV combined with a sedan-like driving experience. At first glance you might think this is just an A-class with a big boot, much like how the Seat Altea XL is a larger Altea, or the Colt Plus is a larger Colt. Yes, the B-class shares the same sandwich floor platform with the A-class, and a similar suspension setup, but this isnt just an A with a big boot, the growth in size has been distributed in the interior proportionately. The rear seats are designed to fit proper full-sized adults, and they even get rear air conditioning vents. On the exterior, you wont find family resemblance with the A-class, but will rather see that the B class seems to be a smaller version of the larger R-class, which also shares the Sports Tourer moniker. The B-class does not look overly big, from the front or back, it is only when viewed directly from the side that you notice it actually has a pretty long wheelbase. I would say interior space is somewhere between the C class and the E class, which makes it great for someone who wants to own a Mercedes Benz, wants the versatility of an MPV hatch, and was previously stuck in a rut because the E class is too expensive and the C class is too small. Step into the interior and youll be greeted by a nice dark and light grey (almost white!) interior, with a big 4-spoke steering wheel in the middle. The dash panel is easy to read, with two large dials showing speed and engine RPM, flanked by two smaller dials with temperature and petrol tank indicators on the left and right, and in the middle of all of that you have an informative LCD panel showing details like average fuel consumption, temperature, gear position, and etc. I have one qualm about the temperature gauge though, while the engines normal running temperature is about 90 degrees Celcius, the 90 mark is not at the middle of the gauge (the middle is about 80 degrees or so), leading you to believe that the engine is overheating, since the normal perception is that if the temperature goes anywhere above the middle somethings gone wrong. There is only one steering column stalk, with controls for both the lamps and the wipers on the left. Not having anything on the right makes it easier to put the key in I suppose. The shift lever is of the gated type, typical of higher-end cars. Comfy white leather seats that match the rest of the interior trim. A pretty good sound system that has small buttons that might be a little hard to press when youre also concentrating on driving. The in-car entertainment system also has the option for an in-car phone, an RM735 option non-inclusive of installation and other misc charges, where you can plug your Nokia, Siemens or Sony Ericsson phone in a space in the center armrest. The phone book of the in-car phone can be accessed via the LCD panel in the middle of the dashboard dials, and you can make calls via the keypad on the center dash area. I suppose this is why all the buttons have been made kind of small, there are just so many buttons to fit on the dash area. The seating position is pretty much car-like, but of course you are positioned higher than the average sedan. With no transmission tunnel or gearbox in the way, footwell space is very comfortable, the arm rest is in just the right location, the armrest on the door is angled upwards towards the front so that the power window buttons are more comfortably accessed. Generally the in-cabin ambiance of the car is great. Having a sunroof over your head also enhances the feeling of spaciousness, though there is an inherent design problem with the louvered sunroof which I will talk about later. It handles pretty much like a car, with good feedback from the steering, and characteristics are pretty much the usual for a front wheel drive car. I didnt push the car much around bends as despite a car-like seating position it does feel abit high, yet somewhat grounded at the same time. Like a Pajero. The 1.7 litre engine is just barely enough to propel the B170 forward, so I was surprised to hear that there is actually a B150 model in some markets. The brakes that come with the car are more than enough for its power, and there is not much drama during hard stopping from highway speeds. The brakes do lack the somewhat progressive feel of other Mercedes cars though. It’s more jumpy like the Audi A4’s. While the AUTOTRONIC CVT transmission does help the engine stay in the torquey sections of the rev band, you cant help but feel as if youre driving through some really really thick and dense air â€“ thats the best way I can describe the feeling, theres just not enough shove. Switching to Sports Mode on the CVT transmission did not really help much there. An indirect steering combined with the slugginess of the powertrain makes this not a very agile drive – but if you’re buying a 5-seater MPV and wanting a fun drive, you’re looking at the wrong segment! 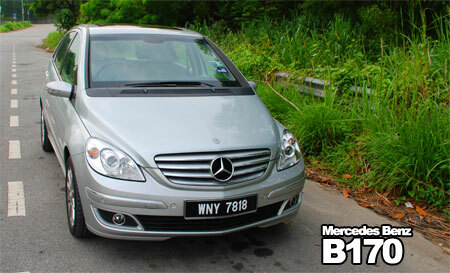 There seems to be a void in the Mercedes Benz B-class model line-up here in Malaysia. There are two B170 models, one low spec and one high spec, then theres no middle ground and the next model is the insanely fast B200 Turbo. DaimlerChrysler Malaysia should introduce the normally aspirated variant of the B200 to fill the gap. Right, so I mentioned that this is the high spec B170. What it has over the low spec version is mainly nicer and bigger wheels, as well as a louvered sunroof. I love the sunroof. The louvered design makes it possible to make a long sunroof that extends to the rear passenger area despite the relatively short roof length. Just be careful when you open it on rainy days. Because of the way the sunroof panels open, if there is water on the roof of the car, the whole interior will get wet. This doesnt really happen with normal sunroof designs, as the amount of water that might drip in is quite minimal. Its a lot more water that will be damping your interior carpets in the Bs case because the louvered panels tilt from a horizontal to vertical position, so all the water on the roof will drip into the cabin. A possible scenario would be you getting up in the morning and not realising it had rained the night before, or perhaps morning dew has collected on the roof. Then you drive off and open the sunroof to enjoy the cool morning air. Your interior gets wet. GG! The high spec version also gets an iPod connectivity kit integrated into the sound system. The connector for the iPod is located in the glove compartment. This isnt a normal aux input, you can actually control your iPod from the sound system. Naturally this type of car is going to be driven by alot of soccer moms, and the general stereotype is that ladies aren’t very good at parking (paultan.org does not endorse this stereotype, heheh) so the car doesn’t just have reverse sensors, but sensors for the front and sides as well! A warning system alerts you if you’re too near to another car on the sides, with LEDs lighting up to show how close you are – the closer you are, the more LEDs light up! There are two sets of LEDs, one on the front and one at the back – you can look at the one at the back through the rear view mirror. The boot is spacious, over 500 litres, and the rear seats can be folded down to make more space, however they cannot really be folded down if the front seats are positioned too far back. As I have long legs and have the seat pushed quite far behind, this rules out the rear bench being folded down whenever I am driving. Other than the boot space, the rest of the car interior seems to lack much storage space. You have the usual glovebox, but there doesnt seem to be anywhere else you can keep your stuff. There is usually a secondary storage area inside the arm rest, but since the B170 has air conditioning blowers for the rear seats built into the arm rest, theres no space for a storage compartment there. On the overall, I like the B-class, but calling it a Sports Tourer in B170 form would be a lie. The B200T would be a real Sports Tourer. Mercedes Benz has managed to Bangle-fy the B-class without ending up looking Korean, so thumbs up there. Worth considering if small European sedans just isnt your thing, the interior space of this boy is much better than cars like the A4, 3-series or the C-Class â€“ and theyre all to be had at the same amount roughly, the low RM200K range.